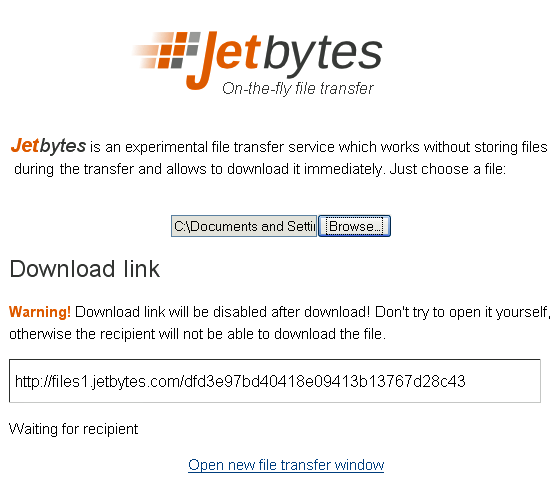 JetBytes is an experimental direct file transfer tool that lets you quickly send files over the net. The application creates direct link between sender and receiver and does not stores files during the transfer. To send files, simply select file on your computer and JetBytes will generate a web URL for it, copy and forward it to any one you want. When recipient clicks the URL the file transfer will began. Note: The file transfer is direct and in real time, so both sender and receiver should be online. You can send as many files as you want and there is no limit on file size and bandwidth. Direct file transfer over internet. Sent as many files as you want. Files are not store during the transfer. No file size or bandwidth restrictions. Both sender and receiver should be online.